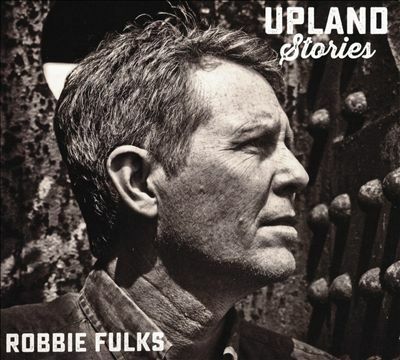 Once again Robbie Fulks has graced this troubled land with a seemingly subdued, but actually powerful acoustic album. Like 2013’s Gone Away Backward, Fulks’ new Upland Stories took me a few plays and more than a couple of weeks before the full impact whacked me over the head. Both albums sound nice and pretty from the get-go — Fulks’ voice has never sounded sweeter and his guitar-picking keeps getting better. But it’s the lyrics that, at least in my case, had to sit with me awhile before they sneaked up on me. More pointed is the stark “America Is a Hard Religion,” on which Fulks is accompanied only by banjo and, in the refrain, a fiddle. “Sent to a savage land, mother knows not why/Plant a seed in rocky soil and perhaps to die,” he sings. Not everything on Upland Stories is so heavy. There is sweet, if understated, humor in “Aunt Peg’s New Old Man,” a celebration of an elderly relative finding a new beau. “Katy Kay” is a devilish hillbilly love song that probably would have fit in on earlier, funnier Fulks albums. Here he confesses, “When I see a pretty girl weeping, I run to her and fix it. When I see a pretty girl smiling, I run for the nearest exit.” The song “Sarah Jane” is another love song, this one featuring a melody and fingerpicking evocation of Mississippi John Hurt. But let’s get back to the heaviness. One of the saddest songs here is Fulks’ cover of Merle Kilgore’s nostalgic “Baby Rocked Her Dolly,” the story of an elderly man in an “old folks” home who spends his time reliving sweet memories of his children, who he rarely hears from these days, as youngsters. There is nothing sweet or nostalgic about “Never Come Home,” inspired by an Anton Chekhov story, which tells of a dying man who returns to his old family home and immediately regrets it. Hard religion and hard truths. Upland Stories is bursting with both. It’s heartening how Robbie Fulks continues to grow as an artist. * A Sailor’s Guide to Earth by Sturgill Simpson. After his breakthrough album, Metamodern Sounds in Country Music, Simpson had to have been under incredible pressure to produce another equally amazing CD. I’m not quite sure whether he’s done that. Metamodern Sounds took traditional honky-tonk/outlaw country and put it through a psychedelic filter. And it worked, thanks mostly to Simpson’s sincere delivery. Wisely, he didn’t attempt to create "Metamodern Sounds Volume II". While there are scattered psychedelic touches on A Sailor’s Guide, this is a whole new animal. 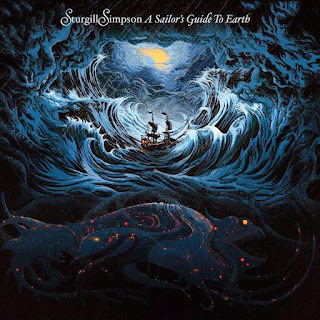 It’s a concept album, a collection of songs dealing with being a new father — that would be Simpson — advising his newborn son on how to navigate the metaphorical stormy seas of this planet. Sturgill saved the worst for the first. The first couple of songs on the album prevent me from giving A Sailor’s Guide an unqualified squeal of approval. The first half of “Welcome to Earth (Pollywog)” goes for baroque, sweetened with strings that come off pretentious in a Moody Blues kind of way. The good news is that on the second half, Simpson’s new pals, the Dap-Kings (yes, Sharon Jones’ band) turn the song into a soul workout. But the strings slither back on the next song, “Breaker’s Roar,” and that initially made me wonder if the whole project was going to be a Kentucky-fried Days of Future Past.